I loved this wedding cake I created for Erin and Shaun! 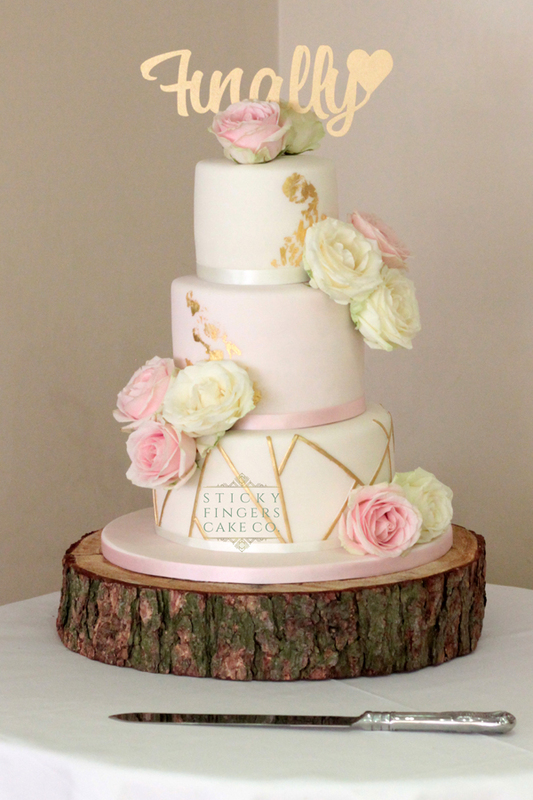 Blush pink, ivory with gold leaf and a gold geometric pattern on the bottom tier – very “on trend” at the moment. The wedding cake was further decorated gorgeous fresh soft pink and ivory roses, supplied by their florist and displayed on one of our rustic log stands. Yummy flavours of Traditional Lemon, Strawberry and Champagne and Cherry Bakewell. It was about 90 degrees that day, so I hope they didn’t melt in the heat! So many congratulations Erin and Shaun, may you have a long and happy life together!